In this paper, we examine the alternation between pre-modified and post-modified nominals, such as aspirin synthesis as opposed to synthesis of aspirin. This type of alternation has been previously explained in terms of rhetorical function (whether the item is ‘given’ as opposed to ‘new’), and phraseology (whether the item is seen as a ‘packed’ lexicalised term, or an ‘unpacked’ expanded nominal). In this paper, we suggest that other factors may also be involved, and we examine four specific cases from two different varieties of scientific English (Scientific Research Articles vs. Science Forums). Here we investigate the underlying constraints that govern this alternation, and we try to establish whether there is a preference for writers to ‘unpack’ nominal groups early on in a text and then to ‘re-pack’ them later on. Overall, we suggest a number of parameters that may explain the choice of one structure over another. Finally, and more generally, we show that this grammatical variation is a particularly productive resource in English nominal groups, and as such contributes to the rhetorical and cognitive construction of scientific demonstration in particular and scientific discourse more generally. Gledhill, Christopher, und Mojca Pecman. 2018. „On Alternating Pre-Modified and Post-Modified Nominals Such As Aspirin Synthesis Vs. Synthesis of Aspirin: Rhetorical and Cognitive Packing in English Science Writin“g. 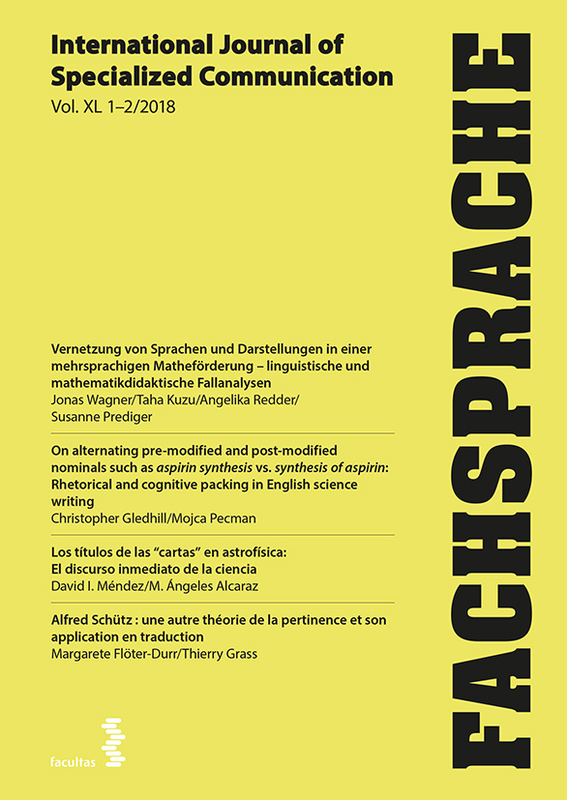 Fachsprache 40 (1-2), 24-46. https://doi.org/10.24989/fs.v40i1-2.1601.